Christmas is filled with traditions and one tradition Purple Rain has established is the production of the annual client calendar. I scan the archive from PR shots taken for campaigns that year, plus my own personal portfolio, to produce a handy desk calendar to help clients organise themselves all-year-round. There is a familiar saying that a picture tells a thousand words, so I want to share one particular photo and it’s story with you. It was a very cold Sunday morning during the big freeze of 2010/2011. The sky was blue but icicles remained on the edge of the farm buildings. I was helping my dad feed some livestock before going to church. I had slipped my Canon IXUS 82 Compact with me, not wanting to miss out on any good photo opportunities, given the ground was covered in snow and the sub zero temperatures. 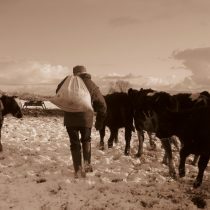 We fed the calves in the lean-to beside our house before hopping into the tractor to go up to feed older cattle who where out in a field just up the main road. 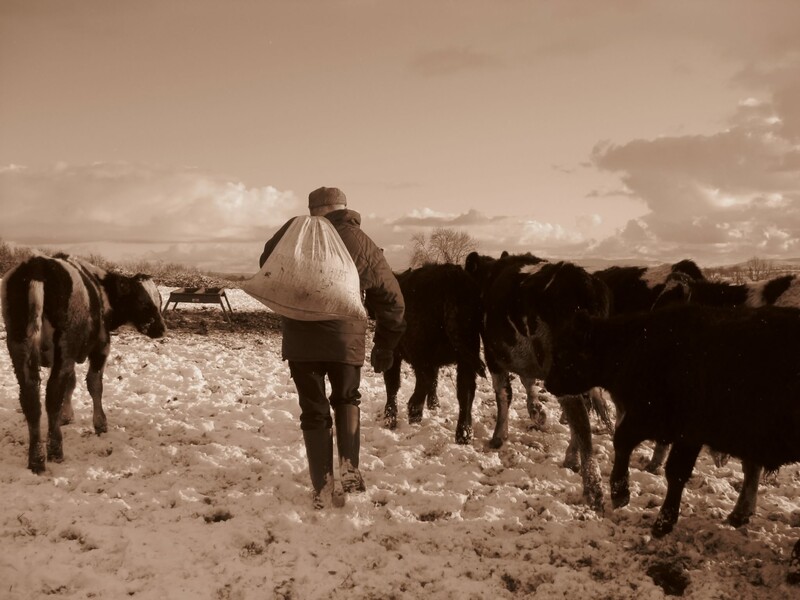 My job was to keep the calves away from the trough until Dad had emptied the bag of meal (partly so they did not knock him down, partly to ensure the meal was evenly spread). As I was ca-hooing as best I could, I also seen a lovely photo composition emerge so, with my gloves on, I fumbled into my coat pocket for the Canon, and thankfully, I got the shot. People often ask me what the best camera is to take pictures. I was told once the best camera is the one that is in your hands. Mine wasn’t an DSLR, I didn’t manually set the shutter speed or aperture, it was all done for me on the compact – it was the composition I had control over. Getting the right shot is all about timing and light. Being around 9.30 in the morning, with a clear sky, the light was good and thus the timing was up to my discretion. I saw a nice opening when the animals were following Dad, with the heavy load of the tasty meal on his back, heading towards the trough. With Dad in motion, you can see the depth of the snow and almost hear the crunch of the snow under his wellington boots. To me, there seems an appreciation of the animals for what they were about to eat, the food sustaining them on such a cold winter’s morning. We headed back down to our own breakfast and a warm cup of tea, content in the knowledge that the animals had survived the cold and had food to keep them warm for the day. 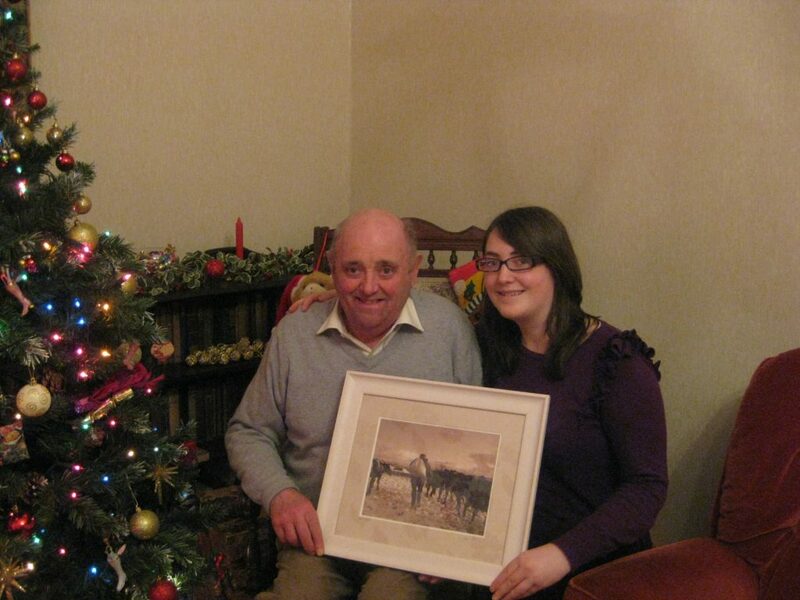 Later that week, I noticed a reader’s competition on the Irish Farmer’s Journal Facebook page and so I entered the pic of dad. As a fan of sepia, I added that filter which gives it a timeless feel. To my delight, I won! My photo would be published in the all-Ireland publication and I would receive some branded merchandise in the post. Whilst I knew I had won, I kept it a surprise from Dad and waited until the paper was out. He perhaps wasn’t as thrilled with it as I thought he would be – “Sure you only got the back of me”. It was a special photo then and it remains a special photo now that Dad has since passed away. Time we have with our loved ones is precious and so we never know how long we are going to have them. May you all enjoy moments with the ones you love this Christmas and may you capture, in your heart and with your camera, many special moments in 2017. Happy Christmas to all my clients, media colleagues, friends and family!